Radio Ballad No 7 - Parker, MacColl, Seeger, etc. In the modern Dante's vision of the universe, there is one hell for boxers and fight fans and a separate hell for folksingers, and they are separated by a lake of fire. And perhaps that is how it is meant to be, although it was not always so. Oh father Zeus, that rules over the height of Atabyrium, grant honour to the hero who has found fame for his prowess as a boxer; and give him grace and reverence in the eyes of citizens and foreigners. It has, since its appearance in the 18th century, proved impossible to discuss boxing without controversy. Even among fight fans. Add to this the canonical status of The Radio-Ballads in the creation myth of the modern media, and the riven, schismatic world of folk music, and you will understand why I step into this particular ring with some caution. I feel a bit like the rustic who is brought in for the champ to chop up for the amusement of a capricious crowd. No Kid Galahad alas; I'm too long in the tooth to be played by a young Elvis and too scrawny to be played by the old one. Just an old pug, and not even a purse to fight for. The Fight Game: explores the world of professional boxing, where the boxers see themselves as latter-day gladiators. The Fight Game is an ironic tale, on the epic theme, echoing the fact that boxing was once the subject of many broadside ballads. I don't think I can have heard any of the Radio-Ballads when they were first broadcast, but it feels as if I must have; particularly the first three, which are the most famous ones. I can't remember discovering them, or a time before which I hadn't heard them mentioned. They seem as integral a part of the post-war romance of the proletariat as the creation of the Welfare State and the defeat of Winston Churchill, and since their production between 1957 and 1964 coincides approximately with the span of my teens, they seem to form an almost personal bridge between the world I inherited and the world I now inhabit. So I must discount for sentiment. And since the format was at once revolutionary and experimental, it would be unfair either to demand or to excuse too much. But the chief reason I am pussyfooting around is that I find it difficult to balance the successes and failures of The Fight Game. And the main cause of this indecision is that I am not sure what the authorial committee of Charles Parker, Ewan MacColl and Peggy Seeger thought they were about when they made it, or even just how far they had a common vision. In their comments, as published in the leaflet attached to the CD, there is much talk of irony. But there is nothing ironic in the bald fact that if any boxer, however successful, keeps fighting for long enough he will get beaten and will probably lose the sympathy of the crowd in the process. And yet it is around this central idea that the piece is structured. Youth will be served --- this saying flashed into King's mind, and he remembered the first time he had heard it, the night when he had put away Stowsher Bill. The toff who had bought him a drink after the fight and patted him on the shoulder had used those words. Youth will be served. And on that night in the long ago he had been youth. Tonight youth sat in the opposite corner. As for himself, he had been fighting for half an hour now, and he was an old man. Had he fought like Sandel, he would not have lasted fifteen minutes. But the point was that he did not recuperate. Those upstanding arteries and that sorely tried heart would not enable him to gather strength in the interval between rounds. And he had not had sufficient strength in him to begin with. His legs were heavy under him and beginning to cramp. He should not have walked those two miles to the fight. And there was the steak which he had got up longing for that morning. A great and terrible hatred rose up in him for the butchers who had refused him credit. It was hard for an old man to go into a fight without enough to eat. And a piece of steak was such a little thing, a few pennies at best; yet it meant thirty quid to him. Let us begin, belatedly, at the beginning. During the war, Charles Parker was convalescing in the company of some American servicemen who taught him to sing Casey Jones and other North American folk ballads. After the war Parker went to work for the BBC as a radio producer and discovered, with great surprise and delight, that there was a native English industrial folk tradition. In the mid-fifties he met Ewan MacColl, ex-lallans poet and co-founder of Theatre Workshop. At around the same time, MacColl met and subsequently married Peggy Seeger, who had been raised in the American folk tradition and was touring the world performing her the music of her own tradition and collecting other people's. It was a remarkable conjunction of talents, the more powerful for coming freshly together, and it was their combination that defined the range and limits of the radio-ballad. "The radio-ballads," wrote Albert Casey, "are about the way we live now, attempting to give this life the quality of epic - 'to make' as John Grierson put it, 'the everyday significant,'"
What gave the radio-ballads their revolutionary power was the use of actual recorded voices. Previously, recorded speech had been rendered into text and spoken by actors. Parker also dispensed with any narrative voice, allowing Seeger's musical arrangements and MacColl's songs to define the dramatic form. They began with a subject appropriate to the ballad form, the heroic death of John Axon, a train-driver. It received overwhelming critical acclaim. Their second piece, The Song of the Road, they regarded as a failure. Parker's head of department insisted it should be less subjective. Ewan MacColl described the result as an "unhappy mixture of radio-ballad and radio feature". The third, Singing the Fishing, is generally regarded as the best and most complete example of the form. Its dramatic structure is defined by the personal narratives of successive generations of fishermen, linked by some of MacColl's most enduring original songs. This was followed by The Big Hewer, on the coal industry. Then extending the limits of the format, The Body Blow, about a group of people disabled by polio, and On the Edge, a study of teenage angst. Which brings us to The Fight Game. I saw, in the person of that amazing Jewish athlete (Mendoza), the embodiment of graceful motion allied to power, intelligence and skill, and realised that here was the ultimate expression of the human body in action. Here was the beauty of ballet wedded to the violence of battle, the destructive force, unaided by any weapon, of Man the Animal, trained and controlled to complete harmony, terrible and sublime. I came, I saw, I marvelled at craft so complete that it seemed elevated to art. The subject of boxing is deeply ambiguous. It is brutal, but it requires intelligence. It is about fighting, but also about money. Its outcomes are very public, but its conflicts are profoundly private; there is, they say, no lonelier place than the boxing ring. At its best it is heroic, at its worst it is just 'showbusiness with blood'. Throughout the 19thC it was illegal in Britain; at the same time it was the first national sport of the English and the first sport to exploit mass communications. Its popularity was the birthplace of modern sports journalism, and of the modern travelling hooligan fan. It was to the 19th century what football is to the 20th. Its ring is square. It is not a subject to approach lightly. When I first listened to The Fight Game, I really heard only the recorded voices of the actuality. I was conscious of the music little more than the way you hear a jukebox in a crowded bar. The voice montage fascinated me. It shimmered like shot silk. It sprang continual small ambushes of recognition. Yes, I kept thinking, that is the reality of such a place and moment, and this other seemingly contradictory thing, I know that one too. I know that voice, I know those tragic and those shifty eyes, I know that way of sliding a pint glass slowly from side to side in the slops on the table, I know that lopsided grin. I could see my great-uncles with their heads together laughing in a corner. I moved towards them delicately through a phalanx of crib-playing aunties. 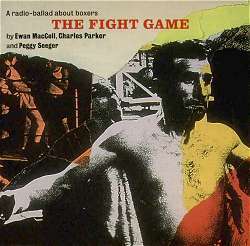 So I was surprised to read in the notes that the voices only occupy 20 minutes out of the whole hour, and that Ewan MacColl thought 'The Fight Game actuality was nowhere near as rich as On the Edge, or Singing the Fishing'. I thought about this a lot. Later it struck me that the radio-ballads team, like many or most artists, were really tourists, however sympathetic, and the snaps they had brought back from holiday were full of things whose subtleties eluded them. 12th Rule of Boxing: if there's fighting, there's writing. "For our seventh radio-ballad," wrote Ewan MacColl, "we chose the unlikely subject of professional boxing. It represented an attempt to escape from the huge canvas of industry and the intensely private world of the sick and adolescent. We rather imagined, I think, that we were embarking upon a work which for a change, would be gay and light-hearted. How naive we were! It soon became apparent that we had entered a world inhabited by people who regarded the prize ring as a symbolic representation of the larger world in which we all live. Boxers, managers, trainers, sports commentators, all stressed this point over and over again. It seemed to us that the boxers, more than any other group we had worked with during the six years spent on the radio-ballads, possessed a strong sense of history. Almost without exception they compared themselves to Roman gladiators, and their audiences to those who 'got their kicks from seeing Christians thrown to the lions'. Now whether this was a genuinely spontaneous response to their profession or whether it was evoked by having seen the Hollywood film Spartacus I cannot say, but I do know that the analogy had real meaning for them." Alas, the tourist! Apparently it never occurred to Ewan as he sat absorbing this clamour of working class voices, that he was breathing the air of a long, literary tradition. Modern sports journalism has its origins deep in the history of boxing. I said that earlier, but it bears repeating. Ewan would have understood the Roman references better if he had read a bit, by way of research. It is far from our intention, by way of apology, to prove that Pugilism is of ancient date in reference to the Greeks and Romans, and that it was sanctioned by these distinguished nations, in their public sports, and in the education of youth, to manifest its utility in strengthening the body, dissipating all fear, and infusing a manly courage into the system. The gladiatorial displays of the Romans we admire not - nor any public exhibitions tending to degrade mankind; but the manly art of Boxing, has infused that true heroic courage, blended with humanity, into the hearts of Britons, which have made them so renowned, terrific and triumphant, in all parts of the world. The ancient Romans conquered and civilised half the world, and it is to them we owe the gladiatorial spectacle of the Prize Ring - modified by modern civilisation yet retaining sufficient of its origin to portray the manners and habits of the people among whom it has taken root. The British people are particularly fond of this exhibition, and there are some good consequences attending it ... With all its disadvantages, therefore, and demoralising tendency, it may be doubted whether the spirit emanating from it may not be productive of benefit among the lower classes. It would be easy to find a hundred such references, spread indiscriminately across the last 200 years. So it didn't need Spartacus to introduce boxers to the gladiatorial metaphor. Before film, and particularly television, all communication between the international boxing fraternity had to be literary, and the loneliness of the ring combined with the moral complexities of the sport to provide some serious debates. I don't blame Ewan for not knowing about this, but it might have helped his art to know that he wasn't the first person to think about these things. Note also that the literary gladiatorial reference tends towards pious disclaimer, and the fighters' use of the metaphor forms an ironic commentary on this. If irony is what you're looking for. live briefly in that sweating air. When I finally penetrated to the music, I wasn't sure what I felt about it. I sought a second opinion. Lucy, an ex-folk studies scholar, discriminating fight fan and long-time admirer of Chris Eubank, was largely contemptuous of the songs. "They sound best when sung by Bob Davenport," she said, "at least you feel he'd appreciate a good bout." I respect Lucy's opinion - she introduced me to Lavengro, one of the classics of boxing literature - but she may not be the most objective witness. There are plenty of folk musicians she would cheerfully watch thrown to the lions. Belonging by instinct to the hands-on school of moral instruction, and having no outstanding scores to settle, I was inclined to be more judicious. Although I would agree that Ewan MacColl's is the least plausible of the singing voices. Most of the songs seemed to work very well in their particular places, but there was something that felt wrong about them overall. First I had to separate them from the rest of the music. The Peggy Seeger arrangements for both subtle and strident brass that weave through the text and songs are just brilliant. So economical and yet complete. I couldn't argue with a single note. In the end, I decided that there were only two places where the songs didn't work, but they were the two key moments; one about sparring, and one about an imaginary fight. Ewan MacColl had picked up on many of the colours in this unfamiliar boxing world, but the one he couldn't catch was the violence, and that's the crucial one. Violence is not literary. Even Norman Mailer, who has fought a few bruising rounds of his own, cannot get it down on paper. If this fragment from Life tells you anything, it is mostly about Mailer as writer and little enough about Smokin' Joe Frazier as a fighter. Mailer wants you to see him more than the action. He does not respect the language of violence. Ewan MacColl makes a similar mistake, although he at least has the excuse that the nature and meaning of the violence elude him. And its textures. Violence has its own language, and it has many subtle shades that only experience can teach you to appreciate. In the sparring song there are voices crying encouragement to the fighter, but they are not voices that you would hear in any gym. They are theatrical voices; they speak inappropriate words, and they do not know what they are intending to convey. One plays football; one does not play boxing. Because MacColl cannot grasp the meaning of the violence, the ultimate purpose of the exercise dances perpetually away from him. Gerald Early in The Culture of Bruising has a good phrase: 'the ritual of male expendability'. Winning is better than losing, but winning and losing are ineluctably entwined. Those who have fought in the ring are separated from the rest of us. That's one reason why so many old fighters linger on at the ringside in various capacities. They may not have fame, but they have touched the thing that poets used to sing about. Do they fight for money or fame or for the sheer joy of fighting? Well, all three, probably, but in different proportions depending on the fighter. Just like any other occupation. These are not mutually exclusive categories. Nigel Benn, interviewed on television, remarked that if you fight for the titles, the money will come, but if you just fight for the money, you won't get the titles or the big money that comes with them. "At any one time when you were down in that fight, did you recognise anyone at the ringside?" "Yes," (Patterson) said. "I recognised John Wayne. I think it must have been the third knockdown, because there I was on the floor, looking right at John Wayne and John Wayne was looking right at me. I've never met him, but he's my favourite movie actor. I think I've seen him in every picture he's made. At first I couldn't figure out how I could be seeing him at the ringside. But I found out later he was plugging a movie during a broadcast of the fight, but all I knew was that I'd seen John Wayne in person, and when I got back up I was still thinking of that and I was embarrassed that John Wayne had seen me down on the floor." You don't have to enjoy hurting your opponent, but you do have to revel in your own skill and hitting power and powers of endurance. And you do have to have a sense of the epic moment. This is the moment when both participants are stretched to their furthest limits, and victory and defeat hang interminably in the balance. It is a moment outside time and beyond logic, when all the various forms of motivation, the money, the glory, the pain and anger, the sense of power and fear of humiliation, all fade into a distant blur and you exist only to do the thing that you are doing. It is rare moment, remembered as a dream; intense and clear, yet as elusive as an absent lover's smile; when everything makes sense since nothing needs to be explained; the moment when you know you are alive. It's a difficult thing to describe; perhaps impossible to put into a song. It is thing more often glimpsed than seen, more likely to be touched than grasped. But it is the moment where the magic lies. And without it, the rest is difficult to understand. I don't know if Ewan MacColl could ever have caught it, but I think he handicaps himself by building the narrative of the piece around an imaginary boxer called Johnny. This enables him to focus on the abstract rhythms of a boxer's life, but it risks making the protagonist symbolic, and this tends to overload the dramatic crisis with significance. It drifts from being a story of a boxer to the story of all boxers, and such an enterprise is doomed to choke on its ambition. There is no doubt of the radio-ballads team's sympathy for the people they met, but there remains a suspicion that this sympathy is contingent on these people's lives being doomed to the traps of poverty and the failures of working-class hell. There's a mean-spirited tone of socialist moralising that creeps in at the end, offering a tidy but misleading resolution. Not all fighters are ultimately losers, and those who have lost heroically are often more respected than those who are thought to have won too easily. And despite the moral of this piece, the fame generally outlasts the money. You can hear Henry Cooper's voice among those of the actuality. He's got both. And he got famously beaten. Twice. It might have been better to use two or three individual narratives, and to generalise from that, as he did in Singing the Fishing. This would have allowed the possibility of an epic moment, and made a fulcrum for the ironies to turn upon. But then, these are experimental pieces, and they had already done something too close to that to bear repeating. And an experiment does not lack value because it fails. It is an unspoken premise of the fight game that the god of victory wears an ironic smile. I went across the room to a torn photograph tacked to the faded wall. It was a shot, in fighting stance, of a former prizefight champion, a popular fighter who had lost his sight in the ring. It must have been right here in this arena, I thought. That had been years ago. The photograph was of a man so dark and battered that he might have been of any nationality. Big and loose muscled, he looked like a good man. I remembered my father's story of how he had been beaten blind in a crooked fight, of the scandal that had been suppressed, and how the fighter had died in a home for the blind. "For the actual fight sequence, for example, there were 86 takes! A gruelling four or five hours for the singers. For the turn-table operator, handling four machines and eight or nine acetates of effects it must have been a nightmare. My most vivid memory of that recording period is of a trumpet player with lips swollen into small balloons, saying that he had nothing left to give. I think we all felt like that." "And the subject is prize-fighting" said Lucy. "Now there's irony for you."